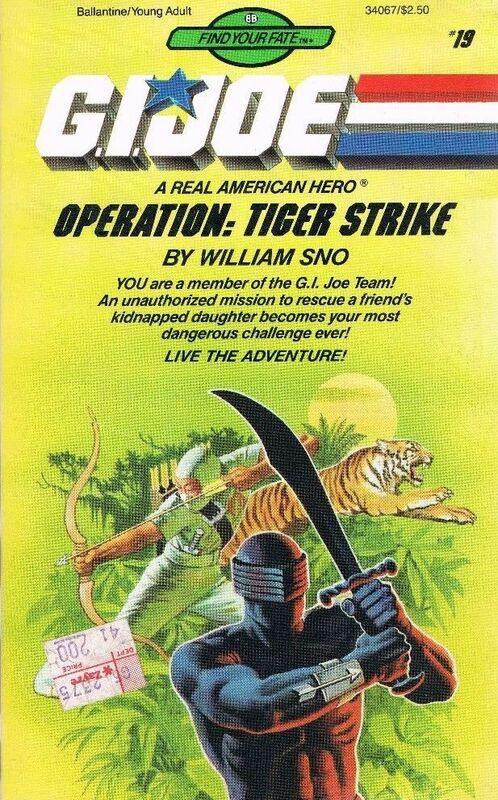 Ninjas and tigers in the jungle–how much cooler could a book cover get? Not much, unless maybe Snake Eyes was riding a shark. And how’s this for artistic license? Check out both Storm Shadow and Snake Eyes. Both appear quite different from their toy, packaging, cartoon and comic book iterations of the time. Snake Eyes’ lack of bandolier reminds me of the Rise of Cobra costume. No lips this time, though. Some serious liberties have also been taken with Snake Eyes’ iconic knight-like 1985 visor. This time, it’s a wrap-around number that looks positively new-wave. Very strange. But hey, at least the toy’s wrist-mounted arrow launcher thingie gets some front and center attention in some form of media. It’s almost as prominent here as his…scimitar? Storm Shadow looks every bit the Golan-Globus ninja, and he’s apparently left his arm wraps at home. What a ridiculous cover. Cool idea, lousy execution. Storm Shadow indeed looks like cannon fodder for the likes of Michael Dudikoff or Franco Nero in an 80’s grade B ninja flick. I wish we’d gotten a 4inch scale articulated tiger by now. Did they have clipart before digital photo editing? Storm Shadow looks like a stock ninja doing a flying side kick with a bow added. Snake Eyes is so tough he glows, or they just stuck colorforms on before printing the cover. Snake Eyes doesn’t ride sharks. He stabs them. I think it was Storm Shadow that stabbed the sharks, just before the Baroness shot him dead (nearly).